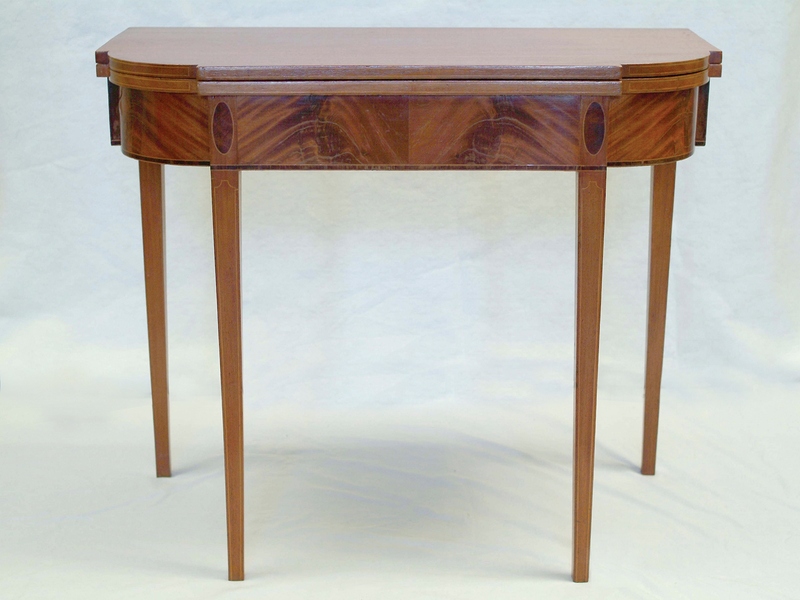 Benjamin Frothingham, cabinetmaker of Charlestown, Massachusetts, served under Henry Knox during the Revolutionary War, but resumed his trade in 1782. 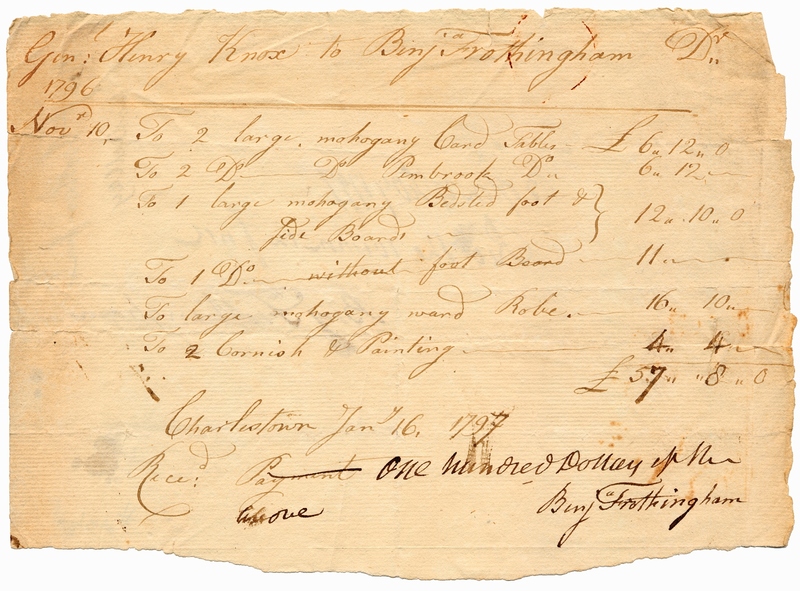 As Knox was furnishing Montpelier, he apparently became one of Knox’s favorite cabinetmakers: The financial papers at the Maine Historical Society show that Knox purchased over a dozen pieces of furniture from Frothingham between 1796 and 1801 (see the receipt pictured on this page for examples). 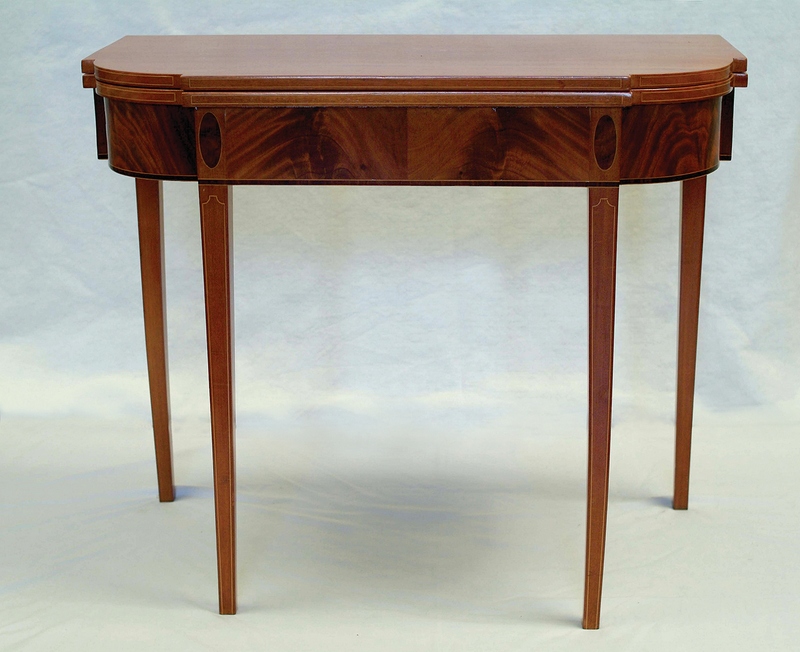 Most labeled Frothingham pieces are in the Chippendale style, but records exist of a Hepplewhite mahogany sideboard, whereabouts now unknown, that indicates Frothingham’s later work was transitioning to the delicate Federal style embodied by these tables. 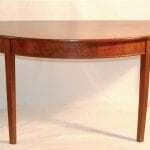 It is not known exactly when the tables left Montpelier, but probably they fell victim to the 1854 auction. One was donated to the museum in 1971, and the other was purchased from a different source for the museum in 1997. Both had a long tradition of having once belonged to Knox. There is little doubt that the two are a matched pair — the grains of the wood on the front match exactly. They are probably the pair of tables listed on the second receipt. 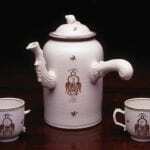 Donated to Montpelier by Eleanor Edwards in 1971 and purchased for Montpelier by the Friends of Montpelier in 1997. Receipt f0r tables and four poster.